I enjoyed your amusing garden glove post you did yesterday so much that I wanted to follow it up with my garden glove trial. 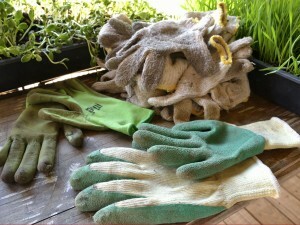 I have a rugged garden to contend with and a simple pair of gloves will not be enough. I have, most of my adult life, taken great care of my hands because the profession we were in (remember!) when in our 20s and 30s required good grooming. I don’t think I ever put my hands in dirt except for the odd indoor pot plant I had. Always wore gloves when washing up and pretty much for all washing jobs. So this wonderful gardening hobby has been a real awakening for me. Just getting on my hands and knees and getting close the the plants is a real pleasure for me, but the dirty nails at the end of the day is a tough one to live with. I still like clean, well-manicured hands. So, my arsenal of garden gloves have been a great help. Now comes the all round comfort, easy-to-handle-plants-delicately and grip-a-spade garden glove trial. Just like you, Chris, I have all those criteria to fill when looking for a great pair of gloves. 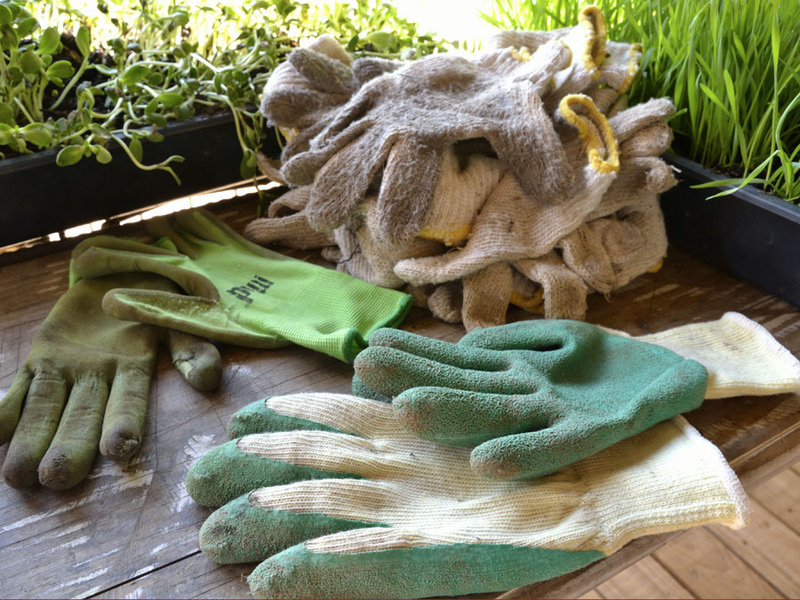 As you can see by my pile, I used cheap 100% cotton gloves most of my gardening life because my hands never became sweaty and the breathe-ability was great. These were really cheap at R2 or R3 a pair at an industrial protective clothing factory – so these are not easy to come by. I could also wash my hands and give my nails a bit of a scrub and all was clean – no mess, no fuss! But they were destroyed after only lasting two sessions in the garden! So, those just piled up!! Maybe they can go into the compost heap! So next pair – I also found groovy gloves (very similar to yours in bright colours) and cost me R59.00 or there about. The lummy green ones on the left you will see that the left-hand glove’s index finger and thumb have holes in them. They lasted 1 month exactly! But you have to realise my heavy-duty gardening included rocks and digging and mud and big projects, so perhaps this was a real Top Gear type of test drive. I really loved the lightness and the breathe-ability. The rubber coating was perfect (not too thick or too thin) and I really could go on all day (which I did some days!) and never felt uncomfortable!! Besides the price, they get a big thumbs up from me! I’m still using them because they are so comfortable! They are called Pnui but I have googled this and … nothing! I have a new pair (the ones in the foreground) but these feel like knock-offs and were cheaper at R35.00. They feel heavier and thicker and the wrist elastic is tight (and I have small wrists … hmmmm!) and after an hour I want to full them off – my hands get very stuffy!! But let me give them a full test before I give my final thumbs up or down! I always wear out my left handed glove first. I love the dipped type as I can pretty much do anything with these gloves on. I had to go back and read yesterday’s post, which I somehow missed. I haven’t tried those rubber dipped type of gloves, I’ll have to give them a try. I’ve always though they would be hot and unbreathable. Thanks for letting us know they are not that way. Also, I didn’t feel like I could ‘feel’ through them. I usually get goat skin gloves. I keep gloves on my hands if I’m outside at all. And, with the new beds you’ve been doing, I am not surprised your gloves only lasted a month! Next time I’m shopping for gloves, I’ll give these a try. Hi Alan, not surgeons, but once-upon-a-time I was a nurse. You get to wash your hands about a hundred times a day and the habit never leaves you. Haa! That’s so funny! We were in pharmaceutical sales and marketing. So the hands were always visible.